Foursquare users will now be privy to special savings and deals at select check-in locations when they use their major credit cards. This is similar to a deal that Foursquare arranged with American Express two years ago, and expanded to Visa and MasterCard holders. Users simply connect their Foursquare accounts to any of these major credit cards to instantly redeem special deals at check-in places. VentureBeat.com reported on how Foursquare is moving forward. This special MasterCard and Visa arrangement is being powered by First Data’s Offerwise, a technology that streamlines the offer redemption process. 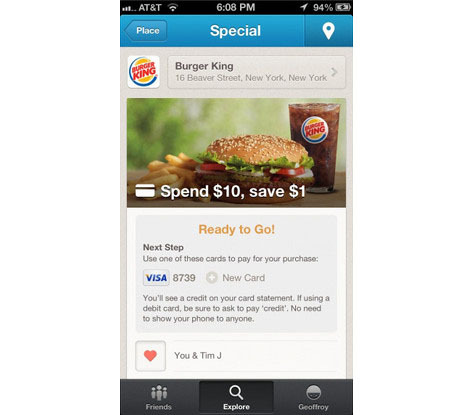 American Express employs a separate deal set-up with Foursquare. The first deal with the new check-in savings was launched last month at 8,000 U.S. Burger King locations. Foursquare users could get a one-dollar discount off a purchase of $10 or more when they checked in and used one of the three participating credit cards. “This is going to be a pretty core part of our revenue model going forward,” said Foursquare product manager, Noah Weiss. To discover how Foursquare can expand your local business opportunities, contact MDG Advertising.